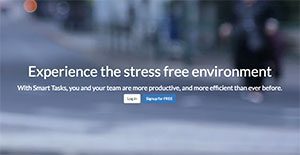 SmartTask is a comprehensive business intelligence and automation software that promises to turn any professional team into a more cohesive, efficient and productive unit. The system puts all related information into a single, accessible hub, giving teams a centralized place where they can gather to work and collaborate. Built to be simple yet effective, SmartTask is also integrated with a rich feature set that includes powerful search, custom fields, custom charts, instant messaging, and mobile app to mention a few. Utilized by teams from General Electric to Reliance Industries, SmartTask is a perfect mix of simplicity and powerful features. From task management, project management to CRM it covers every aspect of a business with finesse. What really stands out is the Custom Fields coupled with Custom Charts that the system provides. This allows for virtually any kind of workflow and analytics. SmartTask offers businesses with a simple yet powerful task management solution where all information is in one place for quick and easy access. Its collaboration features and tools are designed to provide better output and productivity, and notifications are there to ensure that each team member is informed of any changes and updates. Built around a user-friendly interface, SmartTask is developed to be simple to allow companies to integrate the platform with the way they do things without the need to adjust or adapt the software. What Problems Will SmartTask Solve? The first thing that a dev does after reaching his desk, is he mentally prepares a list of all the things that has to be done and all the things that are to be delegated. He goes through his diary pages, email threads and sticky notes to get a sense of his team’s progress. This process takes away his time and is prone to mistakes. With SmartTask, devs can get all this information just by clicking on his team’s project. Ron is a sales rep who meets at least 5 prospective leads in a day. It takes him somewhere between 3-6 meetings or phone calls to convert a lead to paying client. However, with so many meetings, it was very difficult for him to keep track of conversations and negotiations he had with a particular lead. With SmartTask he can create Tags like Meetings, Leads, and Follow-ups. Moreover, going through past conversations in a Task helps him to better formulate his future sales strategy. How many times have you heard a team member saying “Leave it , let’s make a decision!” This is a symptom of an organization suffering from a hindered information flow and low morale workforce. With SmartTask information flow is immediate, clear and precise empowering team-members with needed information to take a decision. Moreover, with a platform where everyone on the organization can view a valuable input, the team member is acknowledged and in turn, he and his teammates are encouraged to keep on contributing. Jack is the production manager. There are at least 50 machines which need to be maintained and inspected regularly. With SmartTask he can create weekly, monthly inspection tasks for these machines and delegate them to responsible persons or vendors. Nisha is an account manager who creates tasks for payment due dates, income tax return dates, Vat returns, sales tax dates, etc. By doing so she ensures her company never defaults on a payment and doesn’t have to pay penalties. Every company has its own characteristics, and may need a special Project Management Software solution that will be fit for their business size, type of clients and employees and even particular niche they deal with. We advise you don't count on finding a perfect software that is going to work for every business no matter what their background is. It may be a good idea to read a few SmartTask reviews first and even then you should remember what the software is supposed to do for your business and your employees. Do you need an easy and straightforward app with just basic functions? Will you actually use the advanced tools needed by pros and large enterprises? Are there any particular features that are especially useful for the industry you operate in? If you ask yourself these questions it will be much easier to locate a reliable software that will match your budget. How Much Does SmartTask Cost? We realize that when you make a decision to buy Project Management Software it’s important not only to see how experts evaluate it in their reviews, but also to find out if the real people and companies that buy it are actually satisfied with the product. That’s why we’ve created our behavior-based Customer Satisfaction Algorithm™ that gathers customer reviews, comments and SmartTask reviews across a wide range of social media sites. The data is then presented in an easy to digest form showing how many people had positive and negative experience with SmartTask. With that information at hand you should be equipped to make an informed buying decision that you won’t regret. What are SmartTask pricing details? What integrations are available for SmartTask? The ease with which you can stay connected with the team and have clarity on responsibilities and accountability. If you need more information about SmartTask or you simply have a question let us know what you need and we’ll forward your request directly to the vendor.